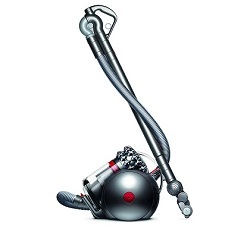 A canister vacuum cleaner is one of the two most common types of vacuums, the other being the upright. Canisters have a unique design in that the motor and filters reside in a small, compact housing that has the suction hose attached to it. There are wheels underneath the main body, allowing you to easily pull and maneuver it around furniture in your home. They generally come with a variety of attachments for cleaning just about anything you need and they really shine on hard floors. A canister can focus a lot of suction ability into the attached brush without having the excess weight of the machine pushing it down into the floor. This makes it a great choice for those delicate hard floors that you don’t want to damage with spinning brushes. The hose is typically flexible enough to extend out many feet so you can reach curtains, stairs, and high corners. Before we dive into our reviews there are a few qualities that are important for anyone looking to buy. While the lightweight machines of years past were really only good on smooth floors like tile and linoleum, the full sized canisters today can clean carpeting just as good as comparable uprights. A company like Miele USA has their Complete PowerLine™ lineup with their powered Electrobrush that attaches to the hose. It is almost like attaching a separate upright vacuum right with its’ own powered, spinning brushes. This gives it the flexibility of vacuuming up dirt from just about any surface. The filters that come on vacuum cleaners have drastically improved over the years. A HEPA (high-efficiency particulate air) filter is designed to push the airflow through a tiny mesh screen that can trap microscopic organisms like dust mites, mold spores, tobacco smoke, and pet dander. Removing these allergens is key to improving the quality of the indoor air in your home. This is especially important if you are using it on any carpets as these tiny irritants can hide deep down into the fibers. Once they are sucked up into the machine you need to have the right sealed filtration system to trap them. Most of the best cansiter vacuums are rated to remove allergens as small as 0.3 microns in size. 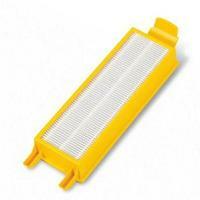 A canister cleaner is known for versatility and the onboard attachment selection is a big key to this. At a minimum you would want to have one or more crevice tools, at least one dusting brush, and an extension wand for reaching difficult spaces. You will also need to have a larger floor tool to provide enough coverage when using it on the floor. For carpeting you will want to have one with a spinning brushroll, preferably with its’ own power supply and hand controls. This will make it easy to adjust power and turn the brushes off with the simple push of a button. This is a great time saver when transitioning between rooms. Foot controls also help as you won’t have to bend down to adjust the suction or floor settings. The design of the machine is such that you are pulling it behind you as you clean various rooms around your house. You definitely want a lighter weight vacuum with smooth rolling wheels, designed to easily roll over thicker carpets just as easily as hardwood floors. Ultimately your desire is to spend time vacuuming and cleaning the surfaces around your home without even thinking about how heavy the machine is or how difficult it is to move around. The better brands do just that by keeping their models light without losing suction power. The SEBO AIRBELT D series is our top rated full sized model, or actually models as the lineup consists of 3 very similar vacuums. The standard D is built for mainly hard floors and rugs as it doesn’t come with their electric powered head but instead has their Kombi attachment with soft bristles. The D4 and D4 Premium are the ones you would want should you have mainly carpets as they come standard with their ET head, ET-1 (12 inches wide) or ET-2 (15 inches wide). You may not have heard of the SEBO company before but they have been building high quality vacuums for a long time. They started with their commercial lineup in the late 1970’s and their models became quite popular with cleaning companies. Their residential lineup followed a little more than a decade later but it had many of the same qualities like exceptional filtration and durability that their commercial cleaners were known for. According to their website, SEBO vacuums have received numerous recognition awards from Better Homes and Gardens, Consumer’s Digest, TIME, Real Simple, and other popular magazines. They also had several innovations to their name including being the first to use an electrostatic microfilter for dust attraction and an electronic brush control with safety shut-off. What features stand out the most on their lineup? And what could use some improvement? Where can you learn more about their robust lineup? Click here to visit our recommended online supplier for current pricing and availability. 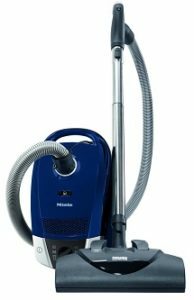 The Miele C3 Complete is our top rated mid sized bagged canister vacuum cleaner, providing tremendous cleaning ability for the cost of purchase. There are a couple of different ‘Complete’ models to choose from depending mainly on how much carpeting you have. If you have medium to high pile carpets then you will want one with their ElectroBrush attachment. The motor powers the brushroll, similar to a full sized upright, so it can agitate embedded dust from the carpet fibers. The power all starts with 1200 watts of suction that is supplied by their Vortex motor with fully sealed flow of air. This very tight seal of Miele vacuums keeps the airflow constant with no internal disturbance so the dirt has virtually no place to settle inside. It just ends up going straight into the collection bag and since it is traveling at a high rate of speed there is no place for the particles to settle. HEPA filtration along with their HyClean™ dustbag, motor protection filter, and exhaust filter combine to remove more than 99.9% of fine dust particles. This is the main reason the C3 earns the Good Housekeeping Seal from ghseal.com. It demonstrates an ability to clean all types of floors with almost no escape of dirt back into your home. What other things do we like most about the C3 Complete? And what things would we like to see improved? Where do we recommend pricing it out and buying when ready? Click here to visit our favorite eCommerce site for additional research, prices, and to read consumer reviews. Even though Dyson is known for building one of the best upright vacuum lineups they also have one of the top canister offerings. Their Cinetic Big Ball Animal is another highly rated unit and is our top rated bagless offering. While they have always been on the forefront of technology as they became the first major brand with 360 degree maneuverability with their full sized vacuums via “The Ball”, this model takes it a bit further. The biggest difference between this Dyson and canisters from other brands is their Cinetic technology which produces a tremendous amount of suction, with the added benefit of never having to wash or replace the filters…for the life of the machine! 36 specially designed tips work together inside to oscillate at up to 5000 Hz, keeping the dust and other debris from settling on anything inside. 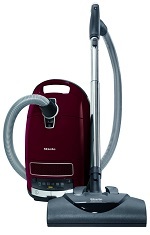 No maintenance costs and no loss of suction are two really attractive features for any new vacuum cleaner. Click here to check current pricing at our top recommended online supplier! The articulating wand will also rotate in 360 degrees so when you combine that with their Ball™ technology you get a canister vacuum that is easy to move around, and also provides great reach while standing still. And should the machine topple over it is engineered to self-right itself, meaning you don’t have to bend over and pick it up. What positive features really stand out on the Cinetic Big Ball? And what features would we like to see improved or added? 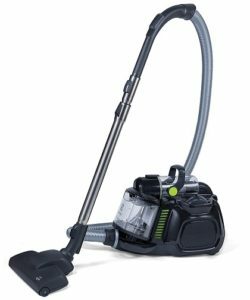 Do you want to check pricing and compare it to similar vacuums? If so, click here to go to our favorite shopping website for shipping options and to read additional reviews. The Miele C2 Complete is the best canister vacuum cleaner for hard floor surfaces and even some carpets. It comes with 2 different cleaning heads that can be used on a variety of flooring like tile, hardwoods, and laminate. The Parquet Twister XL is quite wide and designed to go flat under furniture and other large items. It is perfect for smooth floors as it won’t let the dust particles blow away but instead pulls them towards the airflow. The C2 also comes with the Combination Rug and Floor Tool that is more dual purpose as it can clean area rugs as well. This attachment is more like a standard floor tool found on other canister vacuums. The C2 Complete is bagged and comes with one of the highest rated filtration systems in the home cleaning industry. It will trap and remove 99.97% of the smallest of allergens like dust mites, pet dander, and mold spores from the air as it passes through the cleaner. The end result is fresh air that is expelled back into your home. The bags also seal right up upon removal so nothing can escape during the emptying process. A variable power control lets you choose 1 of 6 different speeds depending on what surface you are vacuuming. This lets you dial it up for area rugs or even low piled carpeting, but then turn it lower for those delicate hardwood floors that you don’t want to damage at all. You can even use the low setting for curtains and baseboards with the help of any number of included attachments. What do we like the most about the Miele C2? What could use a little improvement? Are you ready to price out this capable Miele and even compare it to the competition? If the answer is YES then click here for our recommended shopping and comparison website for vacuums. The Electrolux Silent Performer Cyclonic is one of the best choices for no frills multi surface cleaning at a very affordable price, and ultra light weight. 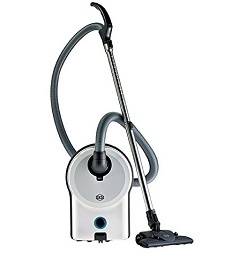 It checks in at just over 10 pounds which makes it a very lightweight vacuum even by today’s standards. The Silent Performer is also compact so you can move it around your home without much difficulty. If this is what you are looking for in your next canister vacuum then keep reading. While it does a decent job on carpets it really shines on area rugs and hard floors like tile and laminate. It does not have a motorized brushroll like some of the more expensive and larger canister vacuums but it does come with their Deluxe bare floor tool. This casts a fairly wide path on smooth floors to pick up all the dirt it encounters. As for carpeting since it is so lightweight it is not recommended for medium to high piled carpets, it just won’t be able to deep clean them. The Silence Pro system comprises the motor and sound-softening cleaning nozzle, both working together to keep noise very low. So low in fact that you will hardly know when you are using it. In a time when vacuums seem to be getting more powerful (and louder in some cases) it is nice to have a model that is designed to not emit an obnoxious amount of sound. What are the notable pros on this Electrolux? And what about a couple of cons? Ready for pricing it out and checking current availability? To verify today’s prices and learn more about it, click here to visit our recommended online eCommerce store.